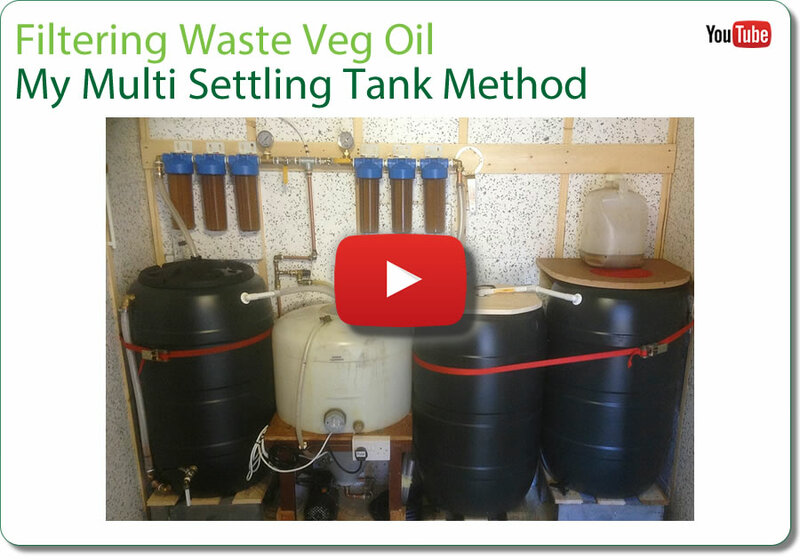 The method I am currently using to filter my Waste Vegetable Oil I have called my Multi Settling Tank method. Below is a image of this that links directly to a YouTube Video. As the name suggest, this method makes use of more than one Settling Tank. These work in series with each tank being fed by the previous tank. Thus, each consecutive tank is fed only the cleanest, most settled oil which it then settles and passes on to the next tank. The process perhaps sounds more complex than it is. Watching the Video will no doubt make things a lot clearer, at least I hope so. A glance at the image above my have some screaming, "He's using mechanical filters... that's not settling!" and this is a fair point. However if you watch the video you'll see that I do indeed use mechanical filters, but I do so purely because I have them. In fact the settling process itself is so efficient, I do state in the video that I don't think they're actually necessary. At the time of writing, I've been running this filtration system for about seven or eight months. In that time I have NOT yet changed any of the mechanical filter elements and I can state categorically that they still look brand new. Why, you ask? Simple - the settling is working. The oil is introduced to the first Settling Tank using the simple (or Cubie) method, so the oil has been settled within the Cubie. The oil within is settled and only the cleanest oil from this first barrel overflows to the next tank. This in turn is full of settled oil and this overflows to the third barrel. Here I do make use of the mechanical filters mentioned above but frankly I don't believe it's necessary. So what have we here? Settling, settling and more settling. There's a multitude of filtration devices and systems listed on the internet, but for me there's nothing as pure, clean and simple as good old settling. We simply let nature do it's ting and gravity pulls out all the fats, water and debris from our oil without fuss. This system does take up a fair bit of space, but I can't recommend it enough. The oil is cleaned to a very high standard.